I was just looking for one of these, but alas, I could not find one freely available so I coded my own. I am sharing here as it appears this is something that is not easily locatable freely elsewhere. Hopefully someone else will find it useful. Here are the settings. You can change the time period the indicator marks the high and low for, so it is customisable for any time range you wish. The examples are 1430 hrs and 1433 hrs, so a 3 minute opening range. Time format is hhmmss. You can add multiple copies of the indicator if you want several different time periods. Below, it is configured for 3 minutes (and GMT). You will have to configure to your local time. What do you think? Have any ideas? Let me know in the comments section below. You might like to take a look at some of my other Ninjatrader bits and pieces. 2019.04.23 Fixed minor bug where custom colours were possibly not being saved. No other changes. 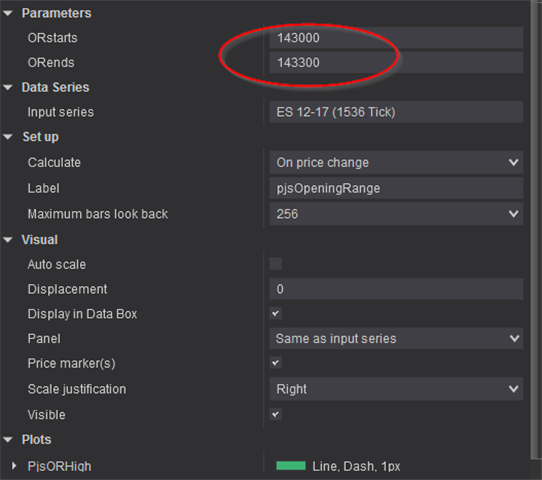 2019.04.18 Added new options to show price labels and a colour of your choice to shade the initial range area, if desired. 2019.04.17 Line colour, thickness, and dash-style (dash, solid, dot, etc.) are now user definable in the indicator settings. 2019.04.07 I have updated the indicator. New features include, better logic, range extensions (or Fibs), a Midpoint, better labels, and an option to add a custom label prefix. 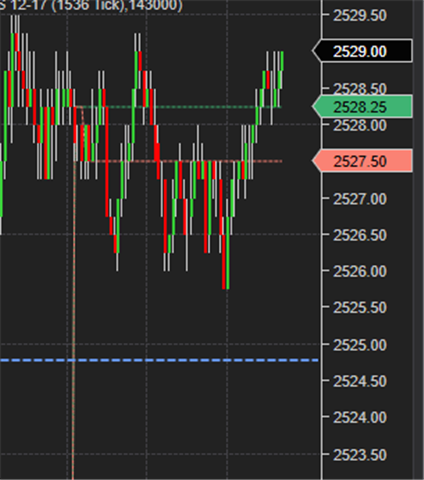 This is because I now use the indicator, with it’s custom start/end times and label with multiple instances to track the open range of other markets on the same chart. As usual, let me know below if any issues and I will try to resolve, time permitting. If you download it, and like it, please do me a favour and give it a little like above so I know. Thanks! This tool, per most of my tools is free for non-commercial use (I define that as a ‘private’ investor with your own funds), but if you find it useful and wish to donate beer money, you can do so Via Bitcoin or PayPal. Any amount (no matter how small) will give you a warm fuzzy feeling and help me keep the power on. Be fair, just donate what you think is right. Thank you. Commercial arrangements and custom versions are available if you wish to re-distribute or use for commercial purposes. Please do not redistribute this, but feel free to link to it here. At the very least, if you liked this or found it useful, please let me know in the comments section below or give it a like/share above. Thanks! Email me via the web site if you want to get in touch. 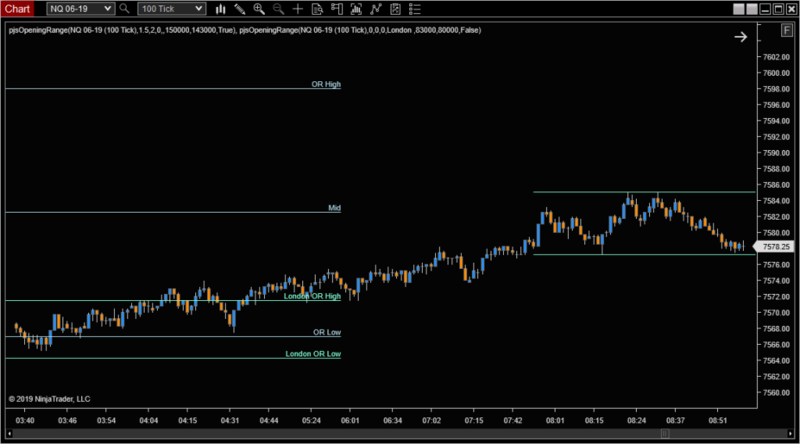 if it’s not too much trouble, could you enable adding fibs of the opening range? TIA. perhaps the midpoint of the opening range as well? thanks! Just a quick note to let you know I have made some updates to this indicator. Changes are detailed in the ‘updates’ section of the original post. All the best, P.
This is great although I cannot see the same setting as on your screenshot. Can you please upload latest version? Would be cool to change the line type to dotted version, turn of labels on the lines and make mid point with different color. Awesome work! Line type has changed and is currently fixed, though I will look at making it user definable. You can turn off the labels. It is a setting in the indicator properties. I will look at the midpoint colour option, too. I have updated the indicator to allow user definable line colour, width, and dashstyle type (dot, line, dash, etc.). Enjoy. Done. Details in ‘updates’ section. Just re-download and install again to upgrade.